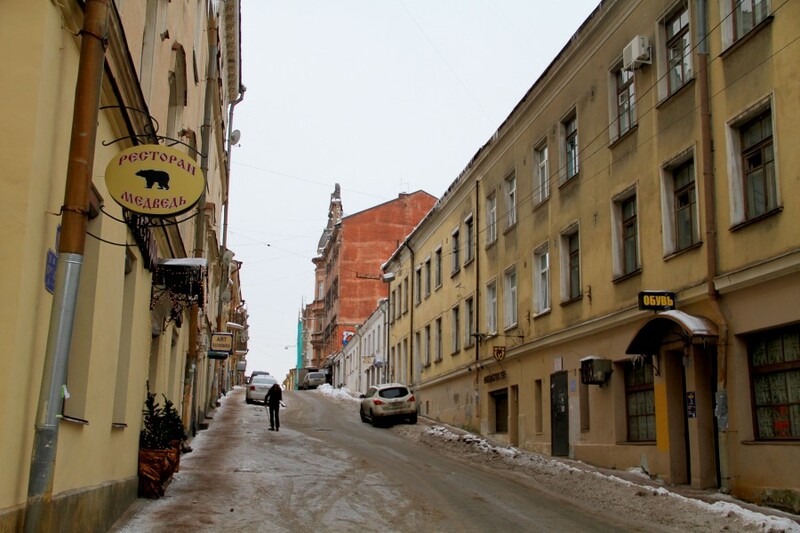 After a few days in St. Petersburg, we hopped in the Land Rover for a day trip. I don't remember the name of the "highway" we traveled on, but again I was very nervous driving this route with cars constantly passing in head on traffic, etc. I think the road takes you all the way to Finland but I could be mistaken. 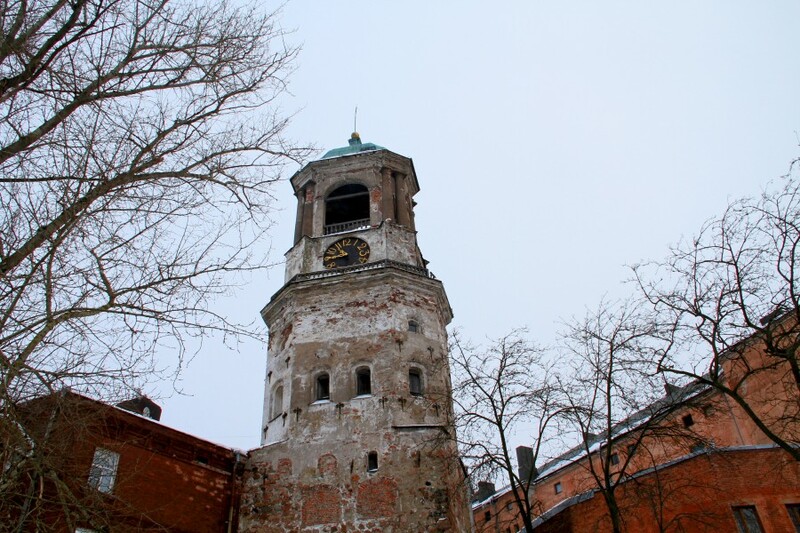 When we arrived in Vyborg after a few hours, I was immediately delighted with the medieval town. The complex history of this place makes it a really interesting destination, particularly for a tourist from a very young country like America. 1. 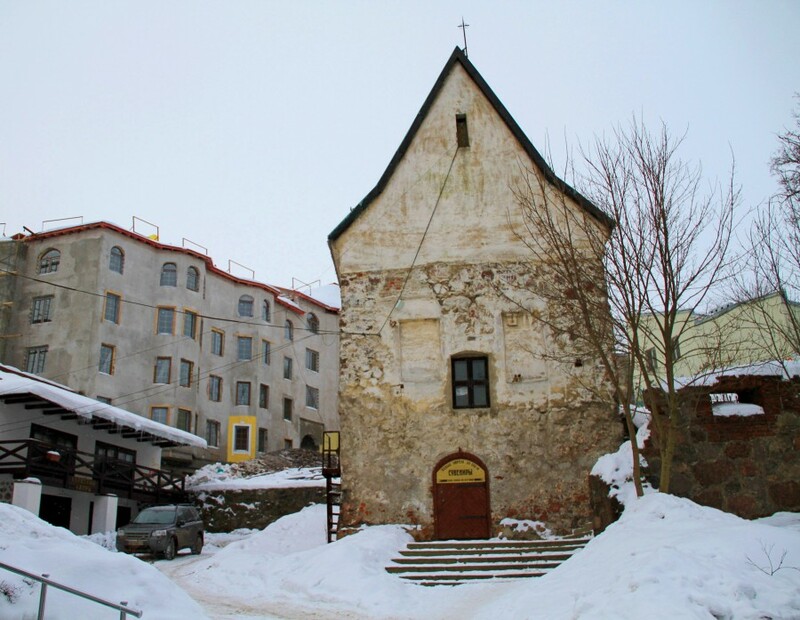 The city sits on the shores of the Gulf of Finland and has changed hands throughout history. 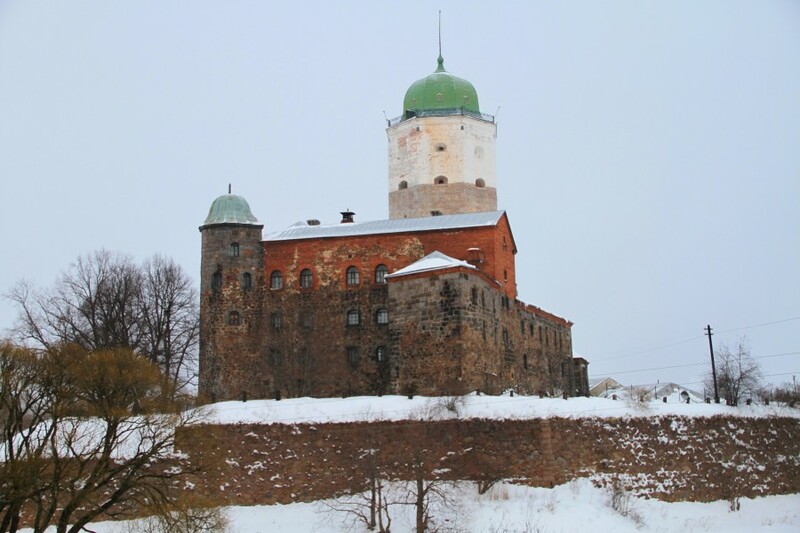 It's home to many fortifications but the focal point of the city is Vyborg Castle, built in 1293 by the Swedes. Imagine - 1293! Almost 500 years before America's birthday. :) The city was first controlled by the Swedes, then Finland. 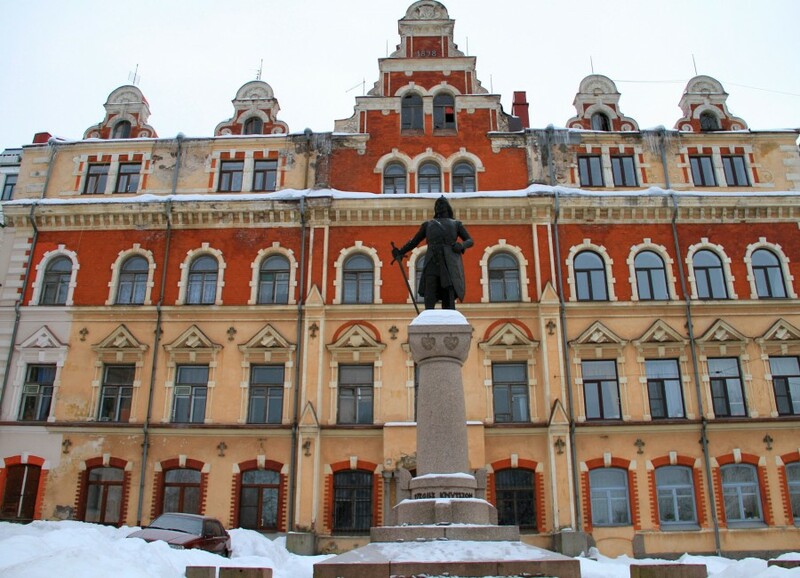 The Soviets gained control of Vyborg in 1944 during World War II. I'm pretty sure that's the basic history, although I understand there were many battles in between these points (including a big one during Peter the Great's reign). My intelligent readers can correct me if I'm wrong. I think I also read somewhere that Vladimir Lenin lived here while planning the Bolshevik Revolution. The cover photo was taken from the top of Olaf Tower. A lot of steps to the top and they're in serious disrepair. Caution is necessary when climbing, but the views are very cool! Here at the castle I also experienced a real horror - no toilet paper in a restroom I had to pay to use. There wasn't even a place for toilet paper rolls in the stall, so I guess it simply doesn't exist here. Maybe they want guests to live "medieval style" when it comes to sanitation. Unacceptable for a major tourist destination. 2. View of surrounding walls from the top of Olaf Tower. And very frozen water! It's difficult for me to imagine these sites in other seasons, when you can actually see water rather than ice. As an American tourist, it's sometimes difficult to tell where land ends and water begins. Visually, the landscapes often merge together. Interesting fact - as of January 2013 images of the castle and grounds can be viewed through Google Street View (though they aren't very good). 3. 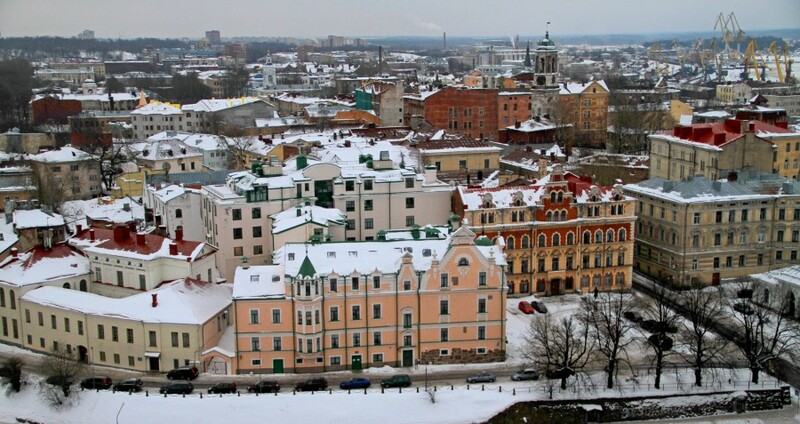 Vyborg is an important industrial producer of paper, but the city's main advantage is its close proximity to richer Finland. The city is a main transportation hub with a sea port and shipyard. However, the provincial city itself is very poor and rundown. This will be clear based on other photos. 4. Pathway down from the castle. Not entirely clear and very slippery. 5. I'll call these "baby" icicles because they're very small. 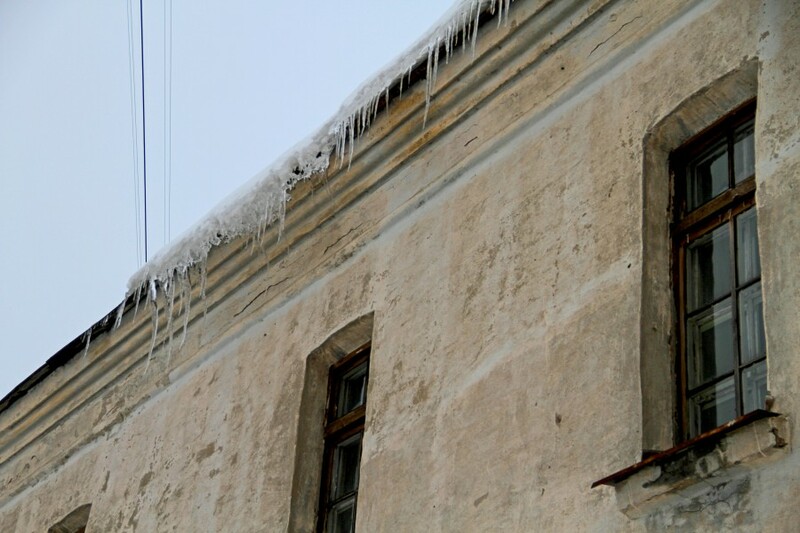 During the trip I was always warned by my host to not walk close to buildings for fear of death by icicle. Some of them are quite stunning but of course dangerous. In DC it never gets cold enough for magnificent icicles to form, though on occasion we will have small ones which melt within a day or two. 6. Many interesting sites in the city, including the Clock Tower which is surrounded by ruins from a cathedral. The Clock Tower was built in the late 1400's. I'm not sure if it's possible to climb to the top? 7. 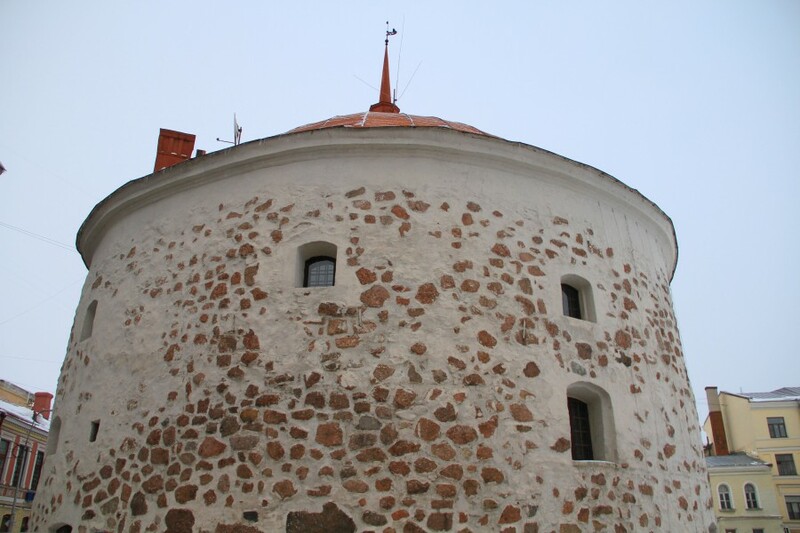 A fortification known as the "Round Tower", built in the mid-1500's. 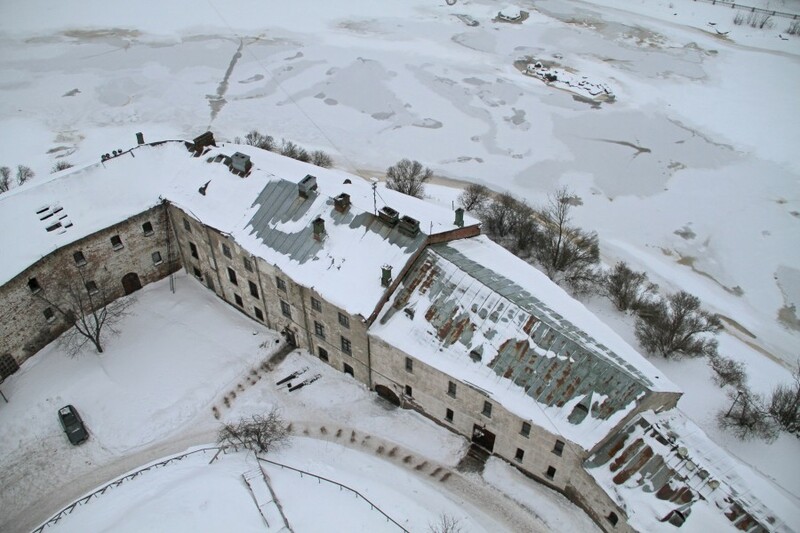 It has been used as a warehouse, prison, drugstore and currently houses a restaurant. The restaurant, like most other things, was closed during our visit. I guess I'm the rare person who chooses to tour Russia in winter. 8. Old church. I cannot find the name of it? 9. Very colorful Town Hall. I assume it houses local government offices. 10. Local resident and blue truck! 11. 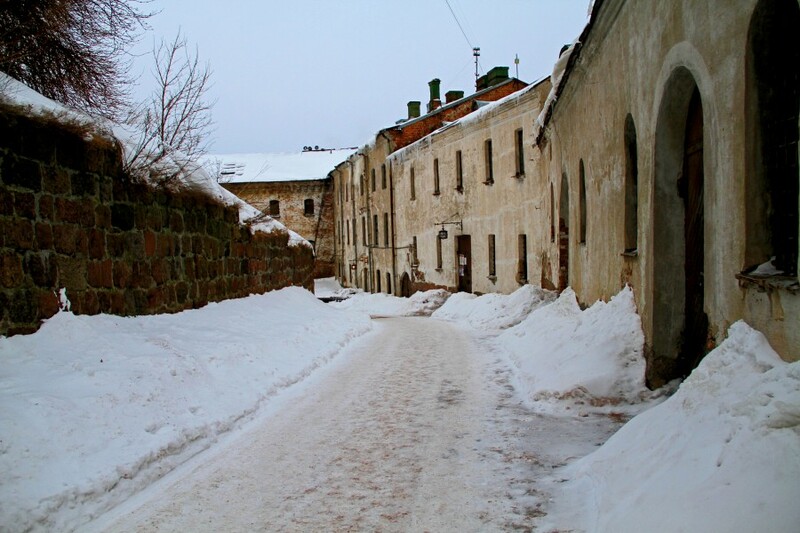 Vyborg was almost completely empty during our visit, like a ghost town out of a movie. Almost all restaurants closed and no people on the streets. 12. Abandoned, dirty street with buildings in disrepair. 13. By mid-afternoon we were completely starving but few dining options available. Then we stumbled upon this place. Perfect I thought! They have pizza. How can pizza be bad? Well, it was in this restaurant I learned another life lesson. Pizza CAN be bad, and it was! Covered in some strange curry sauce and fatty chicken. 14. I don't know this Russian word OXPAHA? I think this is some type of security guard policing the area. 15. There are signs of modern times in the midst of this medieval town, including some nice murals. I don't know who created them or when, but I'd guess they're less than 20 years old because the colors are still very vibrant. 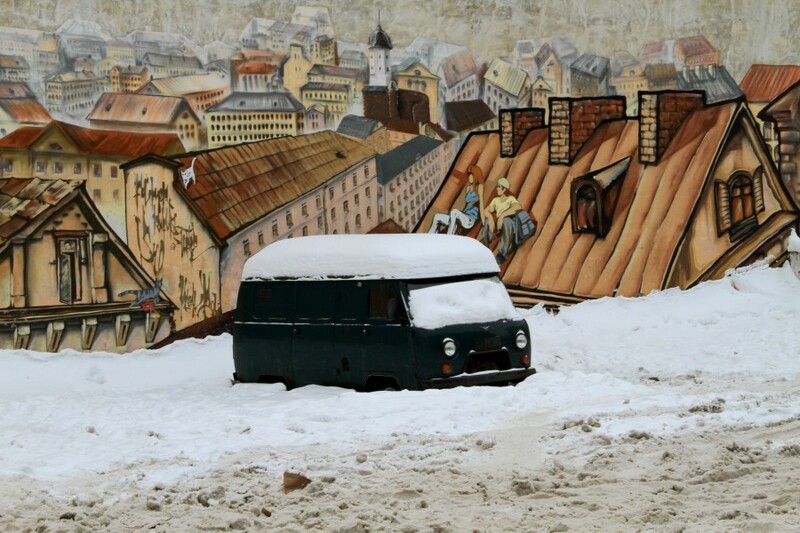 To me this is an iconic Russian scene - old car buried in dirty winter snow. Perhaps some object to such a modern piece of art in an old historical region, but I like it. 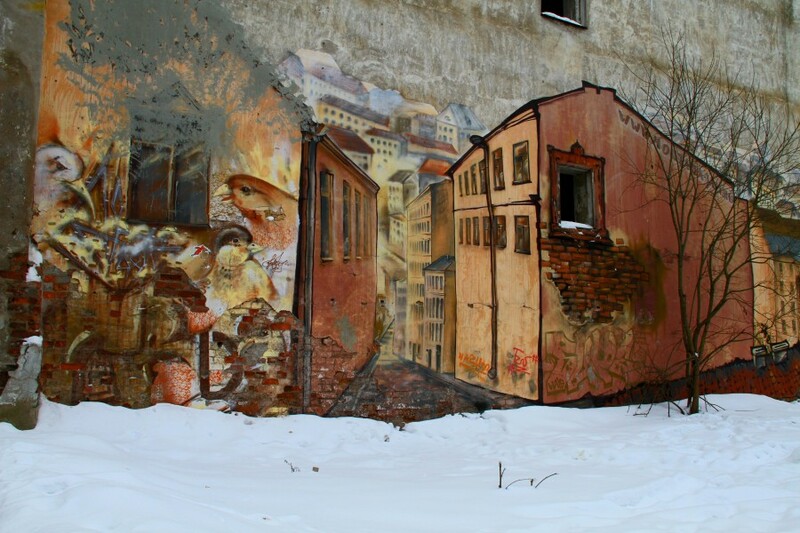 The murals add a lot of life to a somewhat grey, decrepit scene. 16. This one is really impressive! A flat surface but the illusion of dimension in walking down a path. 17. 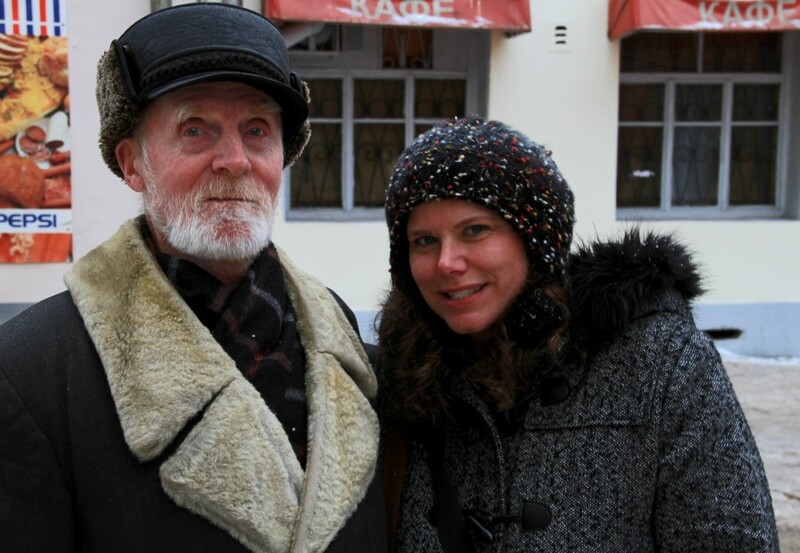 Some of you will recognize this man from my first post on Russia, the one that brought many of you to my journal. 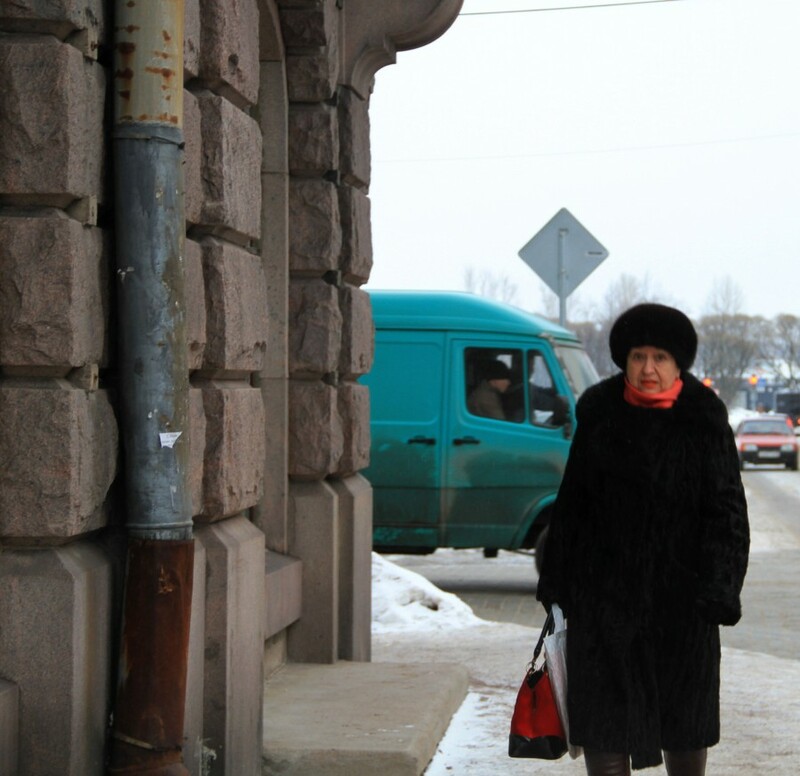 He has lived in Vyborg his whole life. His mother was Finnish, his father Russian. In Vyborg, traces of Finland everywhere. Many store names and signs appear in both Russian and Finnish. The old man approached us on the street, probably just looking for someone with whom to share an afternoon chat. He kissed my hand, gave me a book and posed for a photo. Very kind eyes and gentle spirit. I'll remember him always. 18. Here's the book he gave me. I don't think it's well known because I can't find any information about the author online. His name is Valery Musakhanov. Tell me please other interesting facts about Vyborg and let me know if there are any factual errors in the report. There's not a lot of English language resources available for this city. I hope you all enjoy the May holidays! In America, it's work as usual. However, I will travel to Dallas, Texas next week. If anyone knows interesting sites in this city, please let me know. P.S. : For those on Instagram, you can follow me under the same username peacetraveler22 if you're interested in seeing photos from everyday American life and my travels. Yes, ОХРАНА stands for security. And the road is a road to Finland. It is dangerous. 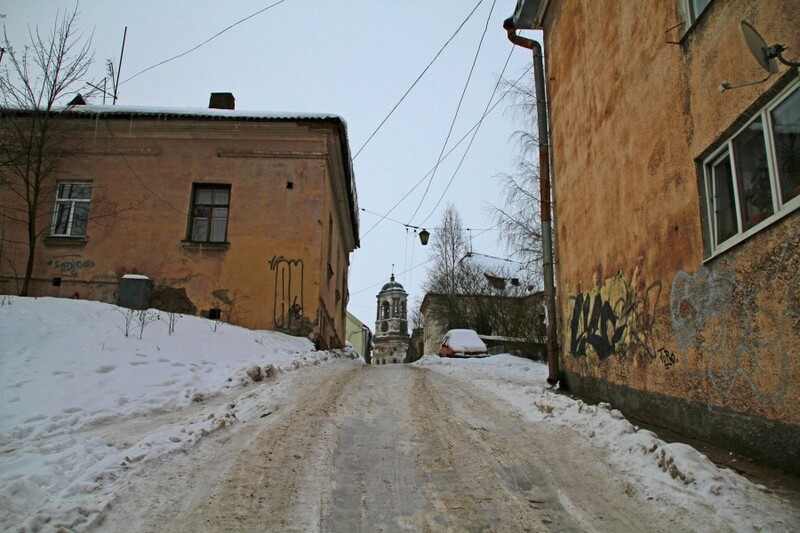 The pathway on 4th photo is apparently the only medieval street in all Russian Federation. I spent a couple of days there in November once, it was equally empty and not too vibrant. Food at every restaurant we went to was pretty bad, and every room at the hotel was smoking, stinking of tobacco. Otherwise worth a short visit, to have a look at the castle and some traces of Finnish architecture. To put history into perspective, the town changed hands a couple of times during WWII. Basically, Finns had entire town's population evacuated, then returned, then evacuated again. And then it was repopulated mostly with families of Soviet military personnel. So there is not a lot of cultural tradition. I agree, it's an easy day trip from St. Petersburg and definitely worth a visit. Russian restaurants, public spaces often smoke bombs. Difficult for non-smokers. Next time you are in the region, travel all the way to Helsinki. The contrast as you cross the border is astounding. Funny enough, I'll be in Dallas next week, too;) I always like going back to my second hometown. While there I enjoy the Arboretum and White Rock lake nearby. This time, I'll try to visit the new Perot museum of Science. I'm told it's quite impressive. Also, the Dallas World Aquarium is good, if you like this sort of thing. It has not only fish, but many animals, birds, plants. Reunion Tower downtown has a revolving cafe upstairs with nice views of the city. If you can travel a bit, Fort Worth has the Stockyards with all the stereotypical cowboy displays. Pretty touristy but it might be interesting. Oh, and eat a lot of steak. I'd love to go to Helsinki. Maybe next time. I'm going to Texas for a work conference but hope to have some free time. I really want to see some cowboys but everyone says they're mostly in Fort Worth. Perhaps I can take the short drive one afternoon. And, yes, I'll definitely eat a lot of steak and Texas barbecue! 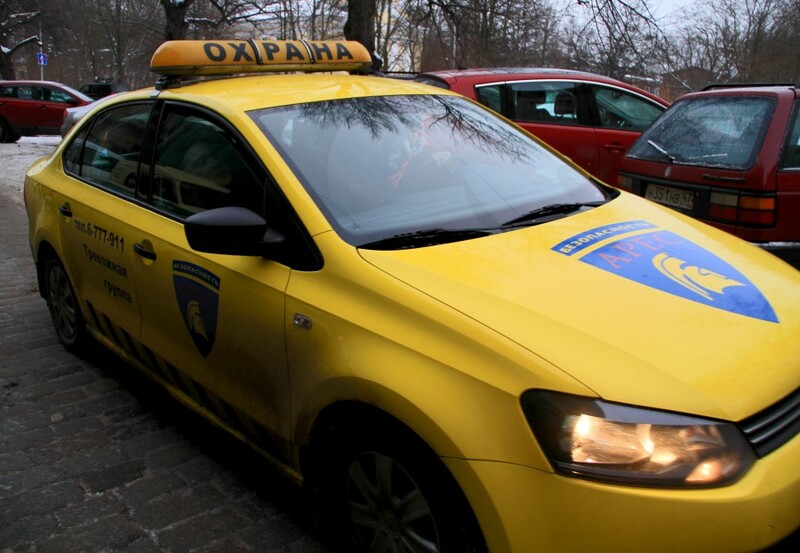 >> I don't know this Russian word OXPAHA? I think this is some type of security guard policing the area. Yes, interesting place but I thought it would have large crowds in summer. 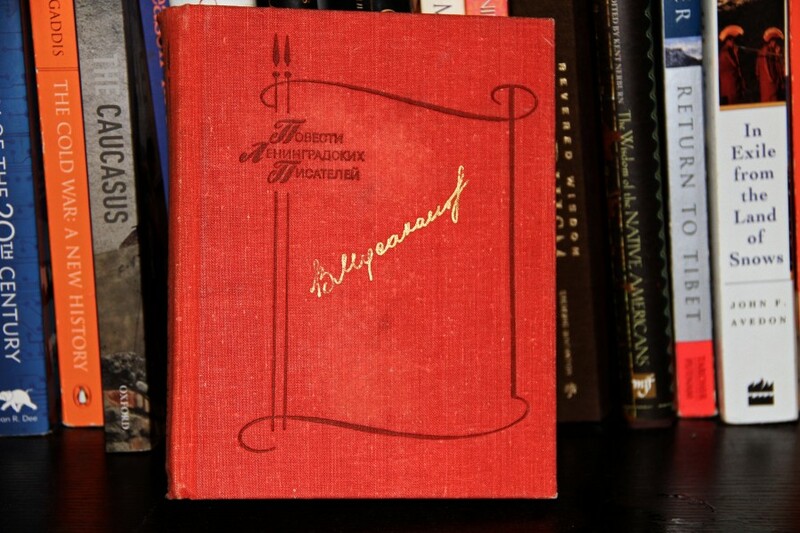 Musakhanov is not a well-known writer. But he may be quite interesting one, I suppose. Looks fabulous! I've only been to Nuremberg. Yes, I ate at several places like this. Food quality was low, service unfriendly. 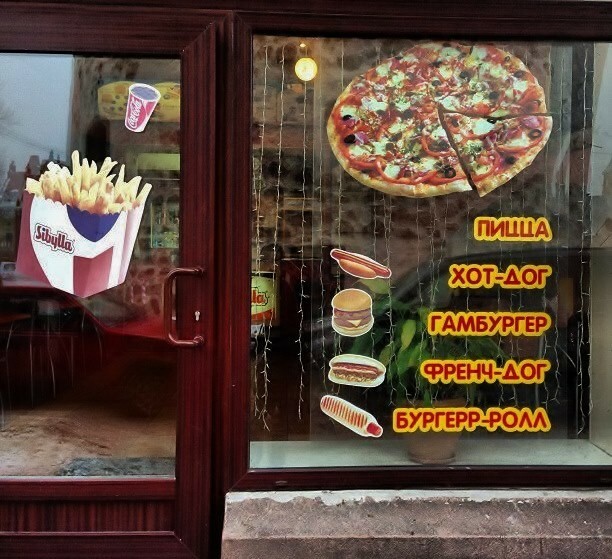 But on some portions of the Moscow - St. Petersburg driving route, there are very few dining options. In America, we're spoiled. Rest stops, lots of restaurants (sit down and fast food) on most American highways/routes. On some Eastern turnpikes there are huge rest areas literally every 10 minutes, with a lot of dining choices for every taste and budget. I read about "the oldest Russian house," but I didn't think that was it. The cross on the roof tricked me and I thought for sure it was a church. Thanks for the additional historical background. :) Complex region. I read that part of the castle also burned during a fireworks display. Well, Vyborg is a popular touristic spot in summer and hosts some festivals, including a Russia-wide historical reconstruction festival where teams from various cities in Russia and Belarus play medieval knights and soldiers and make battle shows on swords. 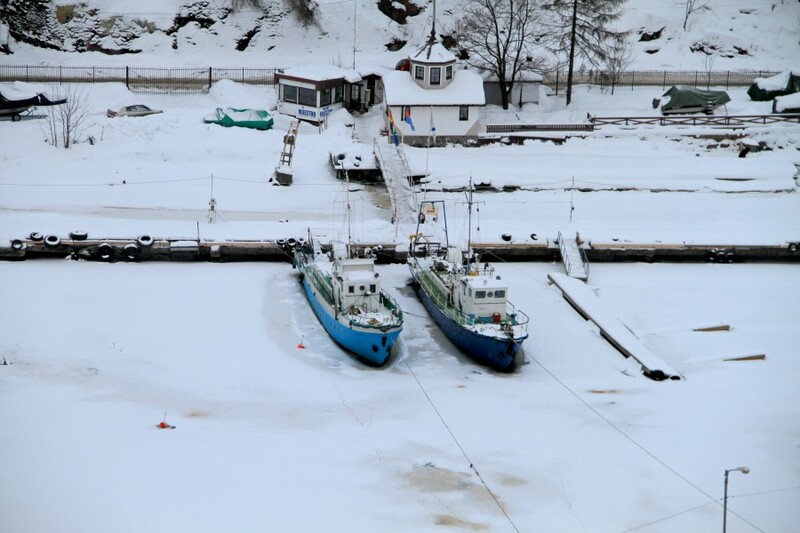 But indeed, traveling to Vyborg in winter is not popular at all. We have the same medieval type festivals in the States. I also read there's a large film festival in Vyborg. I think it will be necessary to return if I make it back to Russia this summer. Интересно было поглядеть на Россию, места где я был. Hi! Nice to hear from you. You're right. I remember we discussed in other posts that in some areas of Russia it appears residents have completely given up. A real sense of hopelessness. Sad indeed. Hi! Love your post, as usual:) Especially the truth which we got used to see (awful condution of restrooms).